Seven Days With You: The Most Precious Memory in our Lives is quite a mouth full, and also the name of a Japanese visual novel by LIFE0. 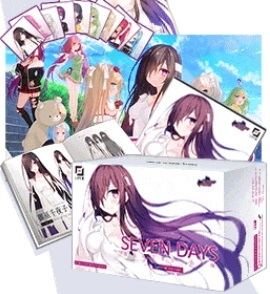 Fruitbat Factory will be releasing a dual language version of Seven Days, making it available in English. They would also like to publish a physical release, and much like ISLAND are turning to Kickstarter for the funding. Seven Days kicks off with the protagonist being given a cursed Blu-ray by a friend. Upon watching said Blu-ray he become possessed by the spirit of a dead girl but fortunately his young exorcist friend happens to be present and able to fight back the possession with a ritual. However, the ritual doesn’t fully work and the girl now exists outside of the Blu-ray. As it would turn out, the girl has the spirit of six dead girls inside her and the protagonist has forty-nine days (Seven days per girl.) to help those girls leave this world without regrets. So kind of sort of like The Ring but different. Letters From Beyond – $1: Access to project updates and comments section of the campaign. Ghost Activity – $35: Digital copy of the game and avatar pack. 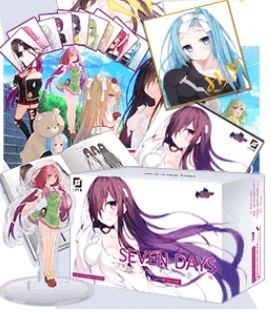 Seven Days – $60 ($55 Early Bird): All previous rewards and the physical collectors edition including a physical artbook and all stretch goal rewards provided they are met. Precious Memory – $150 ($140 Early Bird): All previous rewards and Dakimakura. Memorial – $250 or more: All previous rewards plus a signed shikishi print of a chosen character as well as a 125x180mm acrylic stand figure. The stretch goals all deal with mostly physical and digital goodies to be added to the special edition received with the Seven Days reward tier and greater, these include: Digital artbook ($20,500), digital soundtrack ($28,000), digital audio drama ($37,000), a physical release of said audio drama ($39,000), and a pin badge ($46,000). September 9, 2018 – Fruitbat Factory is announcing their biggest visual novel release as of yet: Seven Days With You: The Most Precious Memory in Our Lives (aka Seven Days) by LIFE0 is coming to western PCs this winter in a dual language full-HD release. Fruitbat Factory is now funding a physical limited edition and additional content for the visual novel on Kickstarter. Let’s play an Occult Mystery visual novel where all the heroines are dead! 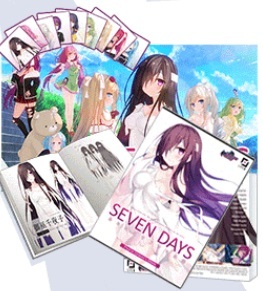 With top industry voice actors and art by the highly popular artist Miko, Seven Days has been well received in Japan. Fruitbat Factory co-published the game, and is now bringing it to English-speaking audiences as well via the new international edition supporting English and Japanese languages. The Kickstarter campaign, which can be previewed until then, is scheduled to launch of September 14, 10:00 PST. It will feature an affordable physical Collector’s Edition as well as an even more premium Special Edition and other goods. Additional stretch goals include localizing an audio drama for Seven Days, and adding all-new illustrations to the game. A couple days before the summer holiday starts… Kanzaki Shuuichi receives a “cursed Blu-ray disc” from one of his friends. Playing it at home, a female ghost emerges and possesses him. Sairenji Murasaki, Shuuichi’s childhood friend, expels the evil spirit with the exorcism skills taught by her father, who runs a time-honored Japanese Buddhist shrine. The ritual, however, is only partially successful, somehow leaving behind the physical human form of the female specter. She identifies herself as Mikanagi Chiyako, seemingly the girl who was murdered in the video recorded on the Blu-ray disc, and tells Shuuichi and Murasaki about her situation. Murasaki explains that a ghost is only allowed to exist for forty-nine days in this world, meaning the seven girls can each have seven days. Shuuichi then makes up his mind to assist all of them in spending their remaining days without any regrets and passing away in happiness. Shuuichi, however, does not realize what will happen to him later. He does not realize that he will have to see each of the seven girls depart from him.